How to Pick and Use Watermelons this Festive Season - What About Watermelon? Sometimes we choose to go for pre-cut quarters of watermelon, neatly cut and wrapped by our local fresh food retailers. This allows us to see the flesh of the watermelon giving us an insight to how flavourful it will be. Often people wonder ‘How to Pick the Best Watermelon’, if they are buying one whole. 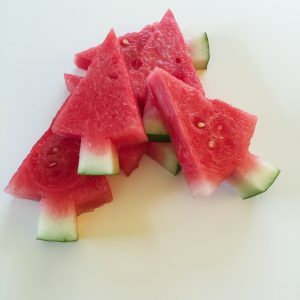 This article will give you some pointers that will help you select the best watermelons on offer along with some festive watermelon ideas. If possible, avoid watermelons that have noticeable cuts, bruises and dents on their outer. Significant lumps in the watermelon indicates that the watermelon received irregular sunshine and water while it grew. 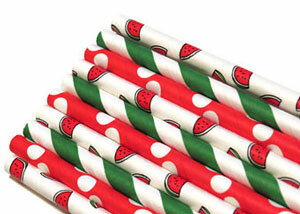 This then leads to the watermelon being dry on the inside. The better tasting watermelons have greater symmetry. A light yellow or cream spot (known as the field spot) mainly on one side of the watermelon is normal. This is generally the side of the watermelon which laid flat on the ground during the growth period. If the discoloration of the watermelon is a nice cream color this means that the watermelon is ripe and ready to eat. 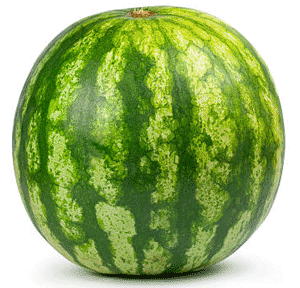 The overall color of the watermelon should be dark green. Choose dull colored watermelons opposed to those that are shiny. The heavier the watermelon, the better. A great tasting watermelon should feel full and heavy in comparison to it’s size. Remember that watermelon is 92% water! 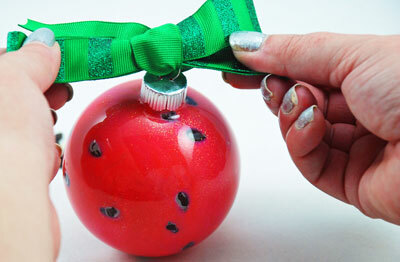 A ripe watermelon will sound deep and hollow when tapped. 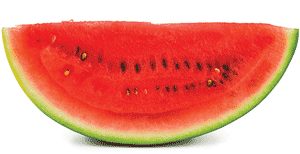 If the sound produced when tapping the watermelon is dull this generally indicates it is under or over ripe. Choose a watermelon with bright red flesh. These tend to be more juicy and flavourful opposed to watermelons with lighter flesh. Avoid watermelons with flesh that appears to be separating from the seeds. 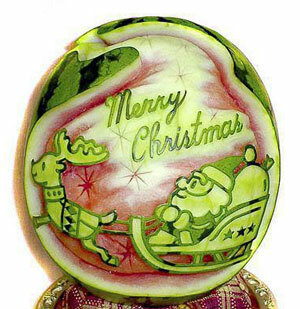 Watermelon and Christmas go well together especially in countries where the weather is warm during December. 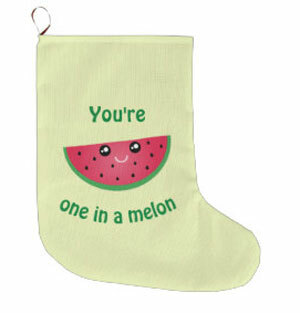 Watermelon is also a popular Christmas fruit in countries that are able to enjoy a white Christmas. Cut your watermelon into triangular pieces. 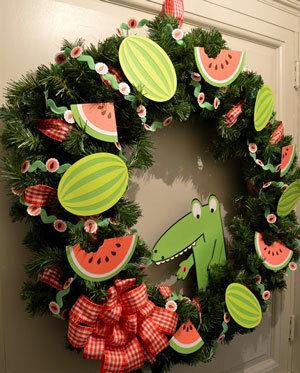 Cut your watermelon into 1 inch think slices and then using the tree cookie cutter, cut out shapes. 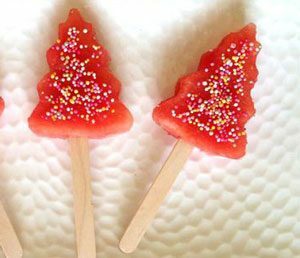 Push paddle pop stick into the base of your watermelon trees. Add honey and sprinkles to the tops of the trees. Place in freezer to make them similar to an ice block, or alternatively chill in refrigerator.